The Giants of Monte Prama are ancient stone sculptures created by the Nuragic civilization of Sardinia, Italy. Fragmented into numerous pieces, they were found by accident in March 1974, in farmland near Monte Prama, in the comune of Cabras, province of Oristano, in central-western Sardinia. The statues are carved in local sandstone and their height varies between 2 and 2.5 meters tall (6 - 8 feet). After four excavation campaigns carried out between 1975 and 1979, the roughly five thousand pieces recovered – including fifteen heads and twenty two torsos – were stored for thirty years in the repositories of the National Archaeological Museum of Cagliari, while a few of the most important pieces were exhibited in the museum itself. Along with the statues, other sculptures recovered at the site included large models of buildings and several sacred stones normally associated with one or more Giants' graves. On the whole the statues are highly stylized and geometrically shaped, similarly to the so-called "Daedalic style", well established in Crete during the 7th century BC. The face of the statues follows a T-scheme typical of Sardinian bronzetti or bronze statuettes, and of neighbouring Corsican statues. Superciliary arch and nose are very pronounced, the eyes are sunken and symbolically rendered by two concentric circles; the mouth is incised with a short stroke, linear or angular. The best preserved head exhibits an "envelope-shaped", crested and horned Nuragic helmet that – like archers' helmets – must have presented the typical long horns portrayed in bronze figurines. Several small cylindrical fragments have in fact been found during excavations. Once recomposed, some of these horns appear to bear small spheres at their terminal ends. 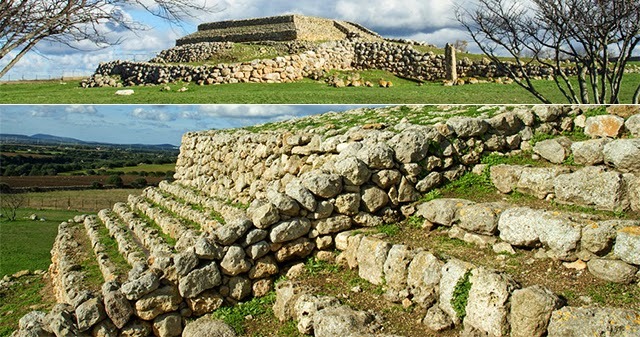 The prehistoric altar of Monte d'Accoddi was built in two phases at the time of the Culture of Ozieri (4000-3200 BC) and the culture of Filigosa and Abealzu (3200-2700 BC). It has the aspect of a pyramid or ziggurat with an access ramp. Around it there is a large village (not excavated). I suspect these are older than Official versions assert. Fascinating. Is there a paper written in English about this culture? Hi, i am alessandro from Sardegna, i have grown up 18 km from Monte d'Accoddi and have studied it for a long time since i first visited it in 1995 when i was doing my service in the city museum... I wanted to point something out. There is no official date for the 'zigguratt' but only for the round ball and the obelisc, which are supposed to date circa 3500 b.C. At that time a village existed and maybe a platform for solar cult, but there is no indication that the zigguratt was there. Some authors as Lilliu speculated on it, but there is nothing precise about it. My idea is that the ziguratt was built after 1800 b.C, more probably after 1500 b.C. I have this idea because we have signs of babylonian presence in Sardegna via the sardinian language, and 2 pieces of cups have been found which seem to contain (according to Pettinato) cuneiform signs from the II millenium b.C. - a top sanctuary built as a small house (like the E.Kua in the Esagila). All these points point on a baylonian origin of Monte d' Accoddi in my opinion. Recent discoveries confirm that the monte prama statues were the first statues built in Europe, dating back to the 10th-8th century bc. While Monte d'accoddi was most likely built around 3500 bc.